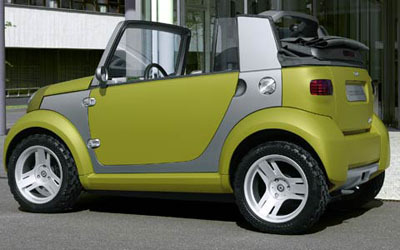 The Smart Crosstown concept shown at the 2005 Frankfurt Motor Show is a design study based around the existing Smart fortwo. 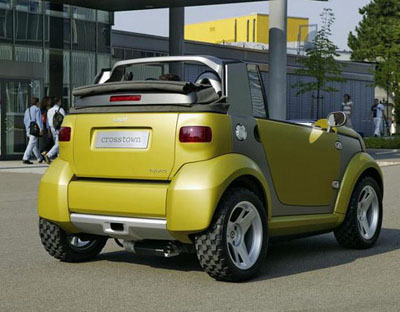 The Crosstown concept is configured mostly like the current two seat model, but Jeep and Mini styling cues combine to form a much bolder-looking car. The crosstown's most distinguished feature is a hybrid three-cylinder gas engine/electric motor, giving 10-percent better acceleration and 15-percent better fuel economy than current gasoline-powered fortwos. The Crosstown also features a stowaway windshield, USB ports, and an optional navigation system. 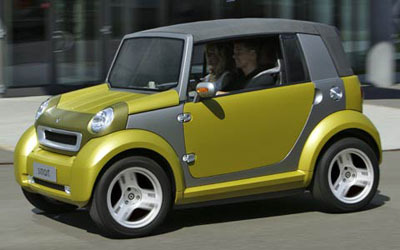 Although Smart is one of the only manufacturers to pull off this type of vehicle in production, the Crosstown concept has a distinctly 'gimmicky' vibe, this type of concept city car has been done many, many times.